← John Sebastian Trares: Photo from a St. Louis area cousin! I received an interesting note from one of our readers recently that confirmed some of my own suspicions. As you know (if you read my last post! 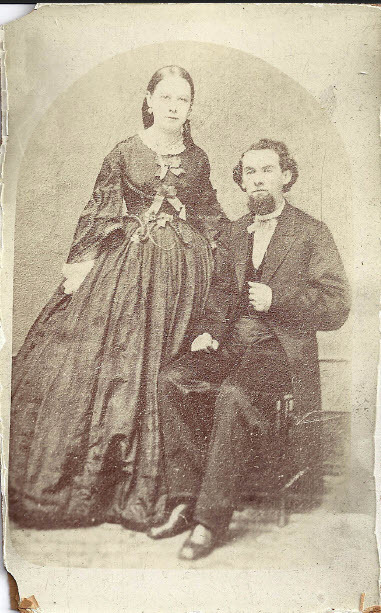 ), our cousin from St. Louis, Jeff Trares, located a photo of John Sebastian TRARES and what (he thought) was his second wife, Cordelia. Another reader, who is descended from the MAY side of the Knapp clan, and knows a great deal more about period dress than I do, made some very interesting comments about the photo. We suspect that this is not Cordelia, but John Sebastian’s FIRST wife, Josephine M. GERBER, who married John on 24 Sept 1863 in Edwardsville, Illinois. She died in 1884. This photo may have been taken right around the time of their marriage or shortly afterwards. Frances Cordelia WINCHESTER married John Sebastian TRARES on 17 Feb 1887, according to my research. She died in 1927. The lady’s dress has a very full skirt over a hoop. Her bell sleeves open to show white undersleeves. The bodice appears to have what were called “jockey points” at the waist-front. If the lady could not afford the latest style, she would have taken the old dress apart and remade it in a more stylish shape. However this woman appears too young to have a 20-year-old dress. The man’s clothing is also typical 1860s. He wears a long coat over a vest and a bow tie. His boots are square-toed. He has a stylish 1860s beard. Mens’ styles did not change as quickly nor as dramatically as womens’ and 1880s mens’ clothing is not much changed. The pose is typical for a wedding photo. The original is probably about 2.5 inches wide and 4 inches tall on a yellowish or tan cardboard. It should have the photographer’s name and place of business on the back (which will help you date and place the photo and determine who the people could be). It may also have a Civil War revenue stamp on the back. I hope my comments are of some assistance. Thank you, Catherine, for sharing your considerable expertise with us about how to date a photo by analyzing the clothing of the people in the picture. I happen to agree with you about the photo being of the Civil War era. The hoop skirt is a definite giveaway. I hope Jeff TRARES sees this blog post. Jeff, please feel free to weigh in on this discussion of your photo with your own comments. Catherine, thanks again for commenting and sharing your knowledge with us. This entry was posted in Family History, Genealogy How To's, May, Photos, Trares and tagged Frances Cordelia Winchester Trares, Josephine Gerber Trares. Bookmark the permalink.